Wanna Cut/Trim/Split MKV Files? Come Here! Sometimes, you will make recordings by yourself to keep marvelous spots reserved on our local hard drive for later playback. However, there is inevitably some noisy intervention evolved in your recording. Admittedly, one of the most forthright measures you can take is to trim that specific part. Nevertheless, just as this post said, other critical issue is that your original MKV file will not be re-encoded. In other words, you can still get a high-quality video file. It seems significant to select a professional MKV cutter to split your MKV files losslessly. Here, with only 3 simple steps, you can make it. Enjoying high reputation from both home and abroad, Joyoshare Media Cutter is regarded as one of the most competitive video trimming tools. 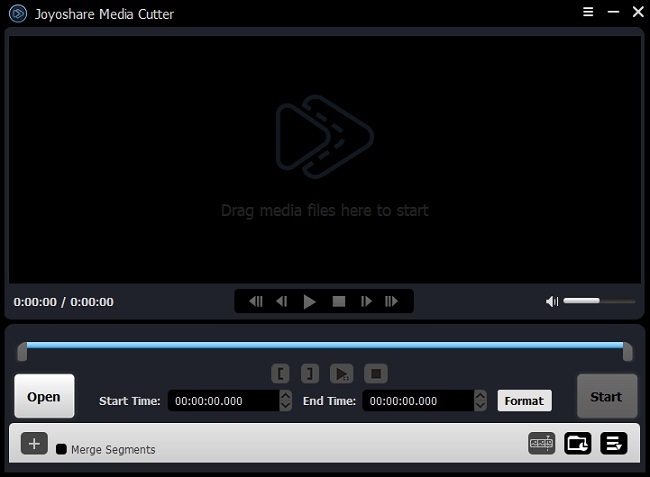 It can be used to cut your large MKV videos into small size by stripping needless pieces. Additionally, it has capability to save the processed videos to any common format as well as popular device, such a MP4, M4V, MKV, MOV, HEVC, WMV, AVI, OGV, iPhone, iPad, game console, Android phones, etc. Notably, there is no quality loss as this smart tool will not re-encode your MKV files. To select a specific area, Joyoshare MKV Cutter provides you with thoughtful timeline and handles. You are empowered to setup exact point to the temporal intervals. Besides, it enables you to customize quality, bit rate, codec, etc, in flexible way. More attractive features are shown as well. 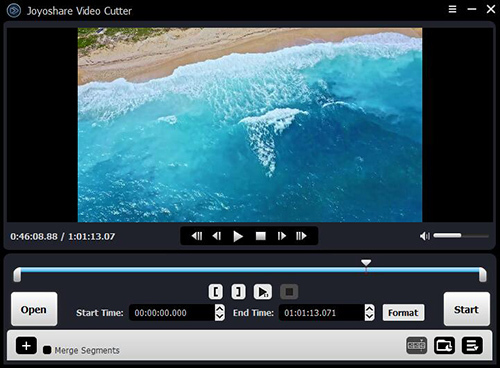 Performing as a video/audio joiner, Joyoshare Media Cutter makes combining distinct sections into one easier. Surely, it is able to extract certain segments from your MKV video file effectively. 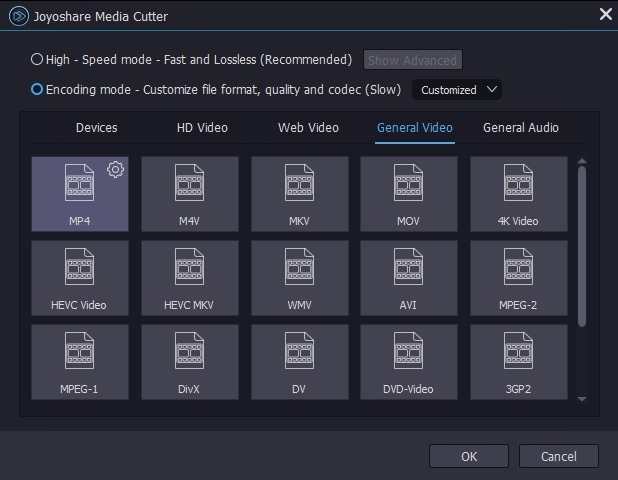 In order to get accustomed to different software's button layout, icon design, operating interface and relevant options ahead of time, you'd better equip your computer with Joyoshare Media Cutter in advance. Hence, you can have roughly operating steps in your mind before you have a look at the following complete tutorial. As long as you have launched your Joyoshare Media Cutter, you can prepare to open your required MKV file. There are two accessible methods you can use to input it. One is to directly press the "Open" button at the bottom left corner while the other is get the designated MKV video ready and straightly drag it to this program. Note: You can only put one MKV video file into Joyoshare Media Cutter each time. Briefly, no batch mode provided for you to deal with multiple MKV files at a time. Once you added your MKV video into Joyoshare media Cutter, it will automatically play it for you. Thus, you can firmly control each second in your way. Any needless parts can be cut off, such as the header, tail and blank content. In order to enhance the preciseness, you have to take the aid of the control key, moving the beginning and end handles to isolate your satisfying sections. Other practical method is to enter specific start time and end time to set up the temporal interval. To enhance the accuracy of every cutting segment, this handy tool comes with well-designed timeline and slider. You can utilize the control key to move both beginning and end handles. Certainly, it is also workable to enter precise start time and end time to set up the temporal interval. Note: Aside from stripping unwanted sections from original MKV file, Joyoshare Media Cutter also support combining different portions into a new one. Simply hit the "+" button to generate more than one fragments and then tick the "Merge Segments" option. You can change the temporal intervals in your way. If you need, you can do as what described here. If not, skip this step and head to following instruction. Having decided a specific selection, you can go forward to click the "Format" panel to bring up all hidden options. On the basis of your preferences, you can choose any format or device you need, like MP4, M4V, MOV, HEVC, WMV, OGV, AVI, MKV, Android, iPhone, iPad, smart TVs, game console, etc. Moreover, if you'd like to produce audio track only from original MKV file, you can go for "General Audio" to select one available format. Amazingly, supposing you choose "Encoding mode" instead of "High-Speed mode", you will have chance to customize the quality, codec, bit rate, size, etc. What you have to do is to click the gear icon at the top right corner of each format. 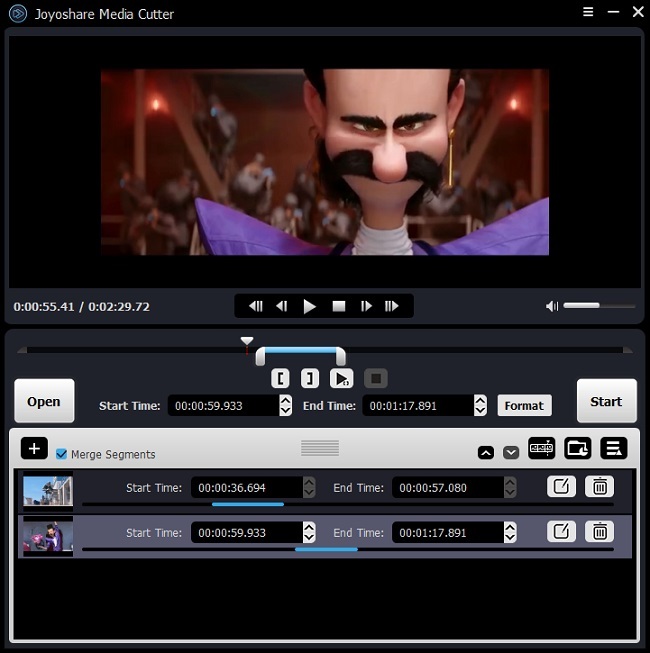 When everything is ready, you can press the "Start" button to make Joyoshare MKV Cutter work for you at up to 606X faster speed. It will only cost few seconds to accomplish the whole splitting process. Once completed, you can navigate to the destination folder to check all finished video files.